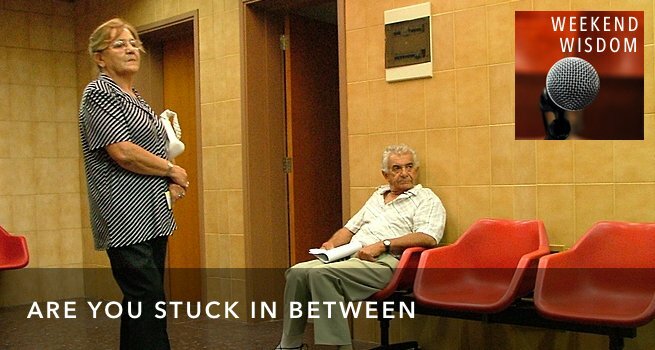 Are you living in an in-between moment? Something in your life is unresolved? You’ve prayed about it, and it seems like no answer has come? How do we live in this in-between space? Chapter 4 of John’s gospel ends with a miracle story, but buried in the middle of the story is one of these in-between moments. That’s the place many of us live. The most awkward moment is the moment in between. Do you remember ever telling someone you liked them? I mean really, that you like-them-like-them? So you worked up your courage, you figured out exactly what to say, and then… there they are, and there you are, and you look away because you’re embarrassed, and you just blurt it out. Then there’s a space. The space between when your words are all out there, and they respond. What are they going to say? What are they going to do? Was telling them the worst idea you’ve ever had? That in-between space is uncomfortable. Sometimes it’s terribly painful. Sometimes it even seems like God puts us in those uncertain, painful in-between moments on purpose. Maybe God gave us some sense of guidance. Perhaps we feel like God made a promise to us, but the outcome hasn’t happened yet. The thing that we think God meant to do hasn’t happened. We want to trust, to have faith. But each day that passes, our prayer remains unresolved. Each day we’re in a position to decide whether to trust again or not. The promise hasn’t been kept. It feels like God’s not showing up. The in-between stretches out longer and longer. Who are we going to be? What will our faith look like? We’re going to close out our study of John 4 with one final scene. It’s got one of those in-between moments in it. Open your Bibles to John 4:46-54. Remember: When Jesus stopped at the well in Sychar, he was headed to Galilee. So, that’s where we find him. Let’s read the passage. Enough people knew who Jesus was at this point that news of his visit spread. It spread all the way to Capernaum, about 20 miles away. In that town lived an official of King Herod’s court. This man’s son was gravely ill, but he had heard that Jesus as a healer. He was desperate, so this man traveled the 20 miles to find Jesus. As best we can tell, his plan was to find Jesus and bring him back so that Jesus could lay hands on his sick son, and heal him. Hopefully he could do all of this–travel 20 miles to where he heard Jesus was, find Jesus, convince Jesus to come back with him, and travel 20 miles home again–all in time to save his son. This dad finds Jesus. When he finds him, he asks. He pleads. He begs. This man, who is an official in the court of King Herod. This man, who is usually in charge of things. Who usually has servants jumping at his call. This man begs Jesus to come with him. This passage seems like a good, standard miracle story. Someone is in need. Jesus performs a miracle healing. The people who see it believe. End of story. Preachers tend to use stories like this to build our faith. See, look what Jesus can do! Trust Jesus. Jesus can heal. Those things are true. But miracle stories like this can be hard on us. Because, well… Jesus isn’t just walking around healing people today–not in the same way, not frequently. And some of us, we’ve prayed those prayers. We’ve prayed in desperation for God to do something. To heal someone. To fix some overwhelming problem. And those prayers seem to have gone unanswered. He’s right, isn’t he? We want to see the positive outcome. We want to see people healed. We want to see marriages saved. We want to see revival that’s clearly something more than just a great new program or charismatic preacher. We want to see those things, but we’ll settle for just the quiet answer to our own prayers. But this dad, he wasn’t coming for some big miracle show. He was desperate. His son was dying. He already had hope. He had heard that Jesus was a healer. He had hope, that if Jesus would come all the way to Capernaum, and lay hands on the boy, he’d be saved. He was begging Jesus to come down to Capernaum. That’s the kind of answer that we want. “God, please sell this house. I can’t carry two mortgages for much longer.” And God says, “Go, your house will sell.” “God, please fix this marriage. It’s almost lost for good.” And God says, “Go, your marriage will be healed.” We want that kind of affirmative, definitive, promise from God. Present tense. He’s alive — right now. But, he was alive when the dad left home?! He was just sick and getting sicker. The dad likely assumed that his son was still alive. That’s why he came here to get Jesus. That’s why he wanted Jesus to come with him to Capernaum. But Jesus doesn’t agree to exactly what the dad was asking. Jesus just tells the dad to go home. “Go. Your son lives.” That’s an answer, but what exactly does it mean? Pause the video right there. This moment the father had a choice. It’s about 20 miles back home again. Another full day’s travel. Should he leave without Jesus? The father was in a bind. If he stayed and kept asking Jesus to come, to just please come, that would show that he didn’t really trust what Jesus had said. If he left and headed home without Jesus, what would he find? If he walked all the way home and his son wasn’t well, what then? Would it be too late? At that moment, he had a choice between insisting on evidence or exercising trust without it. Now, reading these words all this time later, it’s easy to think that the dad trusted and everything was fine. But think about his day. He had a full day’s walk ahead of him. His son was at home sick, dying. His mission had been to come and collect Jesus, and bring him back. But now, he was heading home alone. He was going to walk all day. No cell phone. He couldn’t call ahead and find out if everything was OK. He didn’t know. Sure, Jesus had said his son lives, but he didn’t know. So, even though he trusted Jesus enough to head home, even though he trusted in that moment, he still had a full day of walking one step after the next, hoping, wondering, worrying. Did it work? Each step was an act of faith in the painful in-between, walking home, empty handed, trusting that at home there was a miracle. You and I find ourselves in this in-between space. Walking toward our future, not yet exactly clear on what we’ll see. Maybe God’s given us a promise, a promise for guidance, or healing, or reconciliation or provision. We trust that promise, or at least we’re trying to trust that promise. Every day we’re walking forward, one step at a time. The truth is we haven’t seen that outcome yet. Our prayer hasn’t been answered. The promise hasn’t been kept. We are walking in that in-between moment. Every day, we get to decide. Do we keep walking? Do we trust that God is working—even when we can’t see it? Do we choose to believe? Everyday we get to decide. Do we keep walking? Do we trust God is working? Each step is an act of faith. If that’s where you find yourself today, in an unresolved in-between place, know that your experience is not an anomaly. You’re not the only one. The father in today’s text does end up getting his miracle — but before that happens, he has to spend most of the long walk home, one step after another, waiting and wondering. That’s the same for you and I. 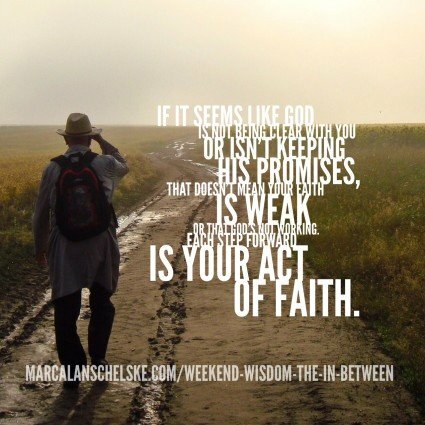 If it seems like God is not being clear with you, or that the promise you thought God made isn’t being kept, that doesn’t mean your faith is weak, or that God’s not working. Each step forward is your act of faith. Part way home, the dad finally got his answer. The dad finally gets word. His son is well! But then something interesting happens. Did you catch it? He does the math and figures out it was exactly when Jesus spoke. The text says, “Then he himself believed, along with his whole household.” But wait? Didn’t the dad “believe” back in Cana, when Jesus told him to go? Verse 50 says, “The man believed what Jesus said to him and departed.” The man believed! So, what’s this? He believes again? Yes. I think so. The reality for most of us is that we believe in layers. Trust is something that grows. When Jesus told the dad to go home, the dad had a choice. Would he trust Jesus’ words? He did. He trusted. He trusted enough to turn around and start walking home empty-handed. But that was just one layer. It was enough to start walking home. Then there was each subsequent step. Would he run back to Jesus and say, “No please, I really need you to come with me…” Or would he keep walking, not knowing the outcome? Each step was a choice to trust. Then later, when he got the answer, when he had confirmation that God had done a miracle, then he believed again. His trust grew. And this time, it wasn’t just him, it was his whole household. That’s how it goes. We trust Jesus, but we have to keep trusting too. 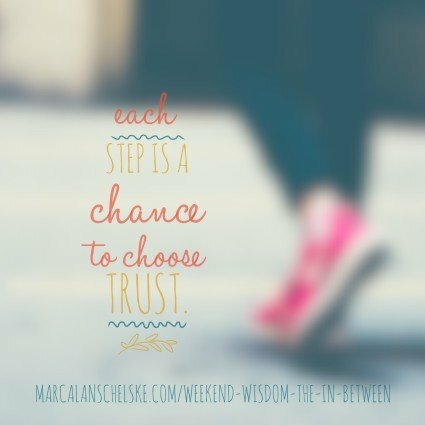 We have to choose to trust again with each step forward during the in-between. And then, when it seems like God shows up, our trust grows again. So what do we do with this passage, two thousand years later? Well, John says that this act was a sign. It wasn’t just a random miracle. It was a sign. Signs are meant to show us something, to point the way somehow. So what does this sign show us? It’s a sign of Jesus’ capacity to do miraculous things, to heal people. I think it’s also a sign about the nature of faith. We have a choice to trust, even when we aren’t getting the outcomes we want. Remember Jesus’ words at the beginning? He said, “You people struggle to believe unless you see signs and wonders.” Well, that was surely true for the dad. And it’s true for us. The dad did get his answer to prayer—but it wasn’t immediately, at least not immediately in his awareness. He had to decide whether to trust Jesus when Jesus said, “Go home.” He had to decide whether to trust Jesus each step of the way home. He had no confirmation, no evidence, no answer — not until he was well along the path. I know many of our stories in this room. I know how much in-between-ness there is here.We have prayers in process, you and I. Family members what we love and we want to see them healed. Financial situations that are untenable, they have to change. Some of us are dealing with a long-extended grief, and it’s wrecking our hearts and there’s nothing we can do about it. I have my own unresolved circumstances. I don’t know how long I can handle them, and I don’t see an end in sight. I’m praying for God to work in those areas, and I have no idea how they are going to be resolved. That walk home is where most of us live. We don’t get concrete evidence of God working in our lives as often as we want. Jesus doesn’t often choose to work exactly the way we ask. That walk home is a part of our journey of faith. It’s not a failure to trust. It’s not a lack of faith. It’s not proof that God’s ignoring us or failing us, or just our imagination. The long walk in-between is where we practice faith. So, keep walking. Let’s us keep walking together, encouraging each other along the way. Reflect on your experience with answered prayers. Which experience has been more common for you? An immediate response? Or a long walk in-between the prayer and the answer? What has this been like for you? What have you learned about God and about yourself in this process? Why do you think we are so uncomfortable with the idea of in-between space where things aren’t neatly resolved?